For a few years our phones have been acting as all kinds of different tools for us, including high quality mobile game consoles. Who doesn't like playing games on their Android device? I love it and I love it even more than playing on the big screen, because with my Android phone I can play whenever and wherever I want. That's why today I want to show you the most addictive type of games for your Android device: adventure games. 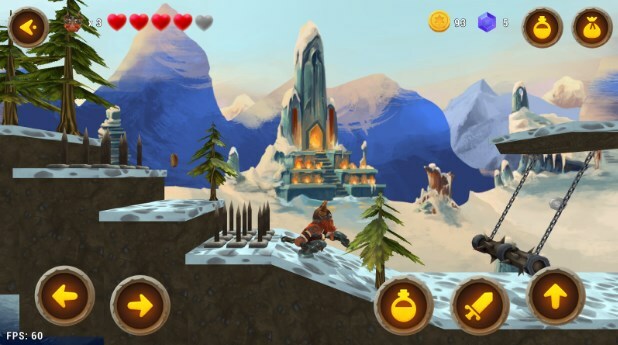 Or to be exact – one of our favorite adventure games on the Android platform: Nine Worlds – A Viking saga. What is Nine Worlds – A Viking saga? It is an adventure platform game for anyone that wants to enjoy an exciting story and challenging gameplay. 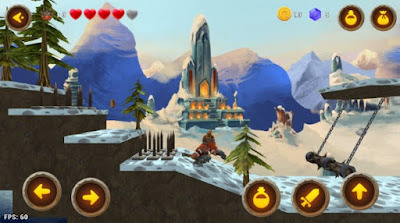 The game is full of unique features, such as cool characters, beautiful landscapes, intuitive touch screen controls, rewards, etc. Let’s see what it has to offer and how to play. The storyline that follows the gameplay of Nine Worlds - A Viking saga features a ship that’s coming back home from a successful Viking raid, when suddenly it gets caught in a terrible storm. The ship starts sinking, taking your brothers and all the treasure with it. You are the only survivor who has to find out who is bringing the nine worlds to a chaos and help the mysterious fairy Ozma bring balance back to the nine worlds. Play as the hero by jumping, chopping, spinning and stabbing monsters and enemies, avoid traps on your way collect coins and valuable gems. Defeat various enemies and gods, find the hidden treasure rooms and complete as many daily side quests as you can if you want to earn achievements and rewards. Can you be the hero that saves the nine worlds from the things that are corrupting them? Emerge as the hero of ages, download this fun game for free from Google Play!